The Iowa Memorial Granite Company of Muscatine, Iowa designs headstones, bronze markers, granite memorial benches, gravestones and virtually any type of monument set or placed above a grave or burial plot in an Iowa or Illinois cemetery. The business is managed by Polly and Randall Geurink. The company was first established in West Liberty, Iowa, in 1943. We moved to Muscatine, Iowa in March 1991. We sell headstones, tombstones, gravestones and grave markers to families in eastern Iowa, western Illinois and the Quad Cities Metropolitan Area which includes the citis of Davenport and Bettendorf in Iowa and Rock Island, Moline, and East Moline in Illinois. 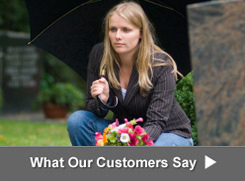 We are one of the most trusted cemetery memorial dealers in Muscatine, Iowa. We frequently design gravestones and gravemarkers that are installed and set in the Greenwood Cemetery in Muscatine, Iowa. 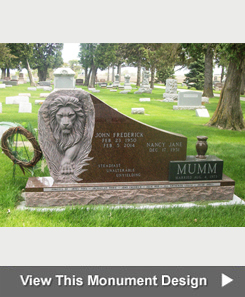 We manufacture personalized upright monuments, headstones, tombstones, gravestones, grave markers and flat markers and sell directly to the public and consumers throughout the Quad Cities Metropolitan Area which includes the citis of Davenport and Bettendorf in Iowa and Rock Island, Moline, and East Moline in Illinois. We display personalized cemetery monuments, cremation memorials and granite memorial benches at our Muscatine, Iowa monument retail showroom. Stop by our showroom if you are interested in buying a cemetery monument or marker or simply want to browse our wide product selection before purchasing an upright monument or flat headstone for a family member or friend. We have an outstanding rating with the BBB serving Greater Iowa, Quad Cities, and Siouxland Region. People interested in looking at monument and marker pictures can visit our design gallery. This web site display many pictures of gravestones and headstones designs available and people interested in buying a monument or purchasing a grave marker can request pricing and estimates through the web site. Click here for information on ordering a marker or monument for an Iowa or Illinois cemetery. The company provides a complete selection of upright monuments, single grave monuments, 2 grave monuments, family monuments, etched gravestones with hand engraved scenes, granite memorial benches, raised headstones, slant face grave markers, bevel top grave markers, flat granite markers, flush or lawn level gravesite markers, cemetery markers for infants and children, single markers, companion markers, bronze markers, bronze plaques, cremation urns, cremation memorials, veterans' memorials, community and civic monuments, granite signs, bronze memorial and donor recognition plaques, private estate and family mausoleums. 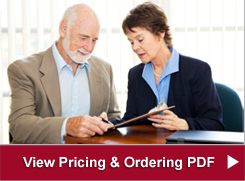 Contact the Iowa Memorial Granite Company at 563-263-5484 to get information on pricing and ordering. Our web site includes many good examples of epitaphs, inscriptions, quotes and sayings that are etched into cemetery monuments. We provide on-site engraving services in which one of our skilled craftsman will add a name and/or date to a gravestone that has already been placed above a grave in a cemetery. The expert memorial masons, sculptors, stonemasons, certified memorialists and monumental masons at the Iowa Memorial Granite Company that design, etch, carve and craft headstones, gravestones, granite memorial benches, cemetery markers, monuments and mausoleums are considered to be the best in Iowa. We serve the residents of the Quad Cities metropolitan area ( Davenport, Bettendorf and Scott County in Iowa; and Moline, East Moline, Rock Island and Rock Island County in Illinois and Cedar, Clinton, Jackson, Louisa and Muscatine counties in Iowa; and Carroll, Henry, Mercer and Whiteside counties in Illinois. It is our commitment to excellence that has differentiated our business for over 65 years. We offer the finest, most beautiful granites from around the world and carve each one in our own production facility. Since 1943, Iowa Memorial Granite has instilled comfort, inspiration, pride in the hearts of our Iowans and Iowa families. We design one-of-a-kind memorials such as the one we designed for John Hoopes, the owner of Hoopes Melon Shed in Fruitland, Iowa. Mr. Hoopes choose the Iowa Memorial Granite Company to design and craft a unique cemetery monument for his family to mark the final resting place for himself, his wife, Mary Beth, and their four children, Holly, Simon, Fred and Kenneth. We designed a black tablet topped with a slice of watermelon made from granite for the Hoopes family. To read a story about this gravestone, read "A slice of life" written by Mike Ferguson published by the Muscatine Journal on August 08, 2013. Our company is know for our the exceptional quality of our work, our competitive prices and the integrity of our management staff. Our stone craftsmen design and manufacture tombstones, monuments and markers at our production facility in Muscatine, Iowa. Families in Iowa and Illinois have trusted us to honor and respect their family traditions since before World War II ended. We also design and manufacture private and family mausoleums, crypts, columbariums and cremation memorials and are considered to be one of Iowa's most respected memorial designers. 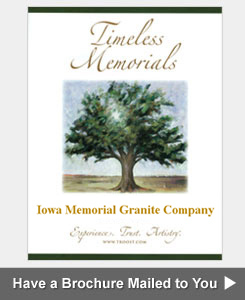 The Iowa Memorial Granite Companyis uniquely qualified to assist you in selecting and manufacturing your memorial. Many other monument retailers and cemeteries out-source the most important part of the process-the actual carving of the memorial. They never see the granite being used and therefore have no quality control. Here at Iowa Memorial, we design and manufacture our memorials right on the premises, assuring the highest levels of quality and customer service. We have hundreds of designs to choose from or we can work with you to create a unique design especially for your loved one. Memorials come in a variety of shapes,sizes and colors. They can be flush to the ground (flat), slightly pitched (bevel), slanted (slant), or an upright monument which is usually a tablet on a base. In choosing a memorial, there are several important decisions that you will need to make. After choosing the granite color, size, shape (flat, raised, bevel, upright, slant, slant on base) and the design style you think is appropriate for your family's or friend's monument or memorial, we will prepare a design for you to approve. Once you approve the cemetery memorial design we create by hand or a CAD program, we will sculpt, carve, etch, engrave and craft your monument or marker. After it has been built, we can deliver it to the cemetery you specify where it will be set at the burial plot you have chosen. Either the cemetery, our experienced staff or a combination of both will install the gravestone you purchased to mark the grave of the special person or family members interred. It is important to find out in advance if the cemetery will charge a fee for the installation of your gravestone or grave marker. This type of marker is level with the ground and usually measures 4" thick. Some cemeteries only allow these types of markers. To view pictures and get pricing information for a flat marker design, click here. There are many variations of this memorial available. For example, the top can be cut straight across, rounded or in the serpentine shape shown. This type of memorial may be used to mark a single grave or two graves. View Slant Face Markers by clicking here. We serve the residents of the Quad Cities metropolitan area (Davenport, Bettendorf and Scott County in Iowa; and Moline, East Moline, Rock Island and Rock Island County in Illinois and Cedar, Clinton, Jackson, Louisa and Muscatine counties in Iowa; and Carroll, Henry, Mercer and Whiteside counties in Illinois. In addition, we design cemetery memorials and monuments for families who live in counties, cities and towns in southeastern Iowa. Our customers often travel from the following counties to purchase upright cemetery monuments and flat markers at our showroom in Muscatine, Iowa; Blackhawk, Buchanan, Deleware, Dubuque, Tama, Benton, Linn, Jones, Jackson, Poweshiek, Iowa, Johnson, Cedar, Clinton, Mahashka, Keokuk, Washington, Louisa, Muscatine, Scott, Des Moines, Henry, Jefferson, Wapello, Monroe, Apanoose, Davis, Van Buren and Lee.